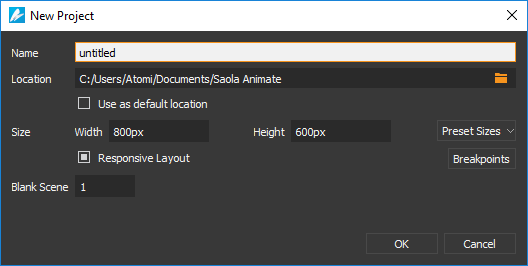 Saola Animate has an intuitive user interface with a dark theme and orange outline highlight on focus. When you first launch the software, you see the Welcome Screen. It’s where you can do some common tasks such as creating a new project, opening an existing project, etc. Saola Animate offers a customizable workspace. The Canvas is surrounded by a menu bar, a toolbar, a timeline, and a set of panes. You are free to toggle panes, change the location and size of panes, and customize the shortcuts to your liking. Saola Animate is easy to use right from the start. To begin with, you need to create a new project. Just click the New button on the Welcome Screen or on the toolbar or press CTRL+N to start a project. It can be a non-responsive project whose scene size is in pixels or a responsive one whose scene size starts at 100% of the container size. Keep in mind that you can always change the project parameters later. You can also convert between non-responsive and responsive projects when you want. So, don’t worry too much about the choice you make at this moment. Responsive layout allows you to create different layouts for a single document, making the document function well at different screen sizes. You can also make use of flexible layout to make your document adapt to the window size changes. Using relative units instead of fixed units, flexible layout keeps elements relatively aligned with each other and with their container. Saola Animate has DIVs, text, and basic shapes. You can quickly insert these elements into a scene by using toolbar buttons or commands in the Element menu. Regarding text, Google fonts are available to beautify your text for free. Besides, the HTML5 animation software lets you import images, audio, and videos into your document. 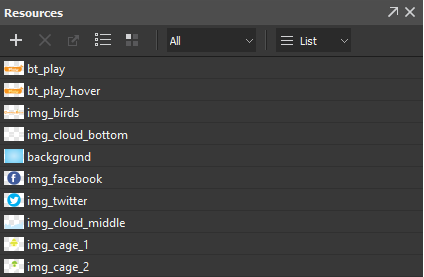 Just either drag these files from your computer onto the Canvas or use the toolbar buttons to add them to a scene. Saola Animate keep a copy of the resources in the Resources pane. Actually, you can directly drag files into this pane, then add them to a scene later. Creating HTML5 animation is of course the core part of the HTML5 animation software. And without a doubt, the Timeline pane plays an integral role in the animation-creating process. It gives you the capability to view and control all timing aspects of a project. In addition, you can make use of symbols to reuse animations as well as elements, scenes, or timelines. Symbols enable you to build complex animations by nesting one animation within another. For details, see Using Symbols to Reuse Animations. Lastly but most importantly, you need to preview your document and export it to HTML5. Previewing is crucial because it helps notice any required change, especially when your document has a great deal of interactivity. It’s also worth mentioning that you can create a cool loading screen for you animation to brighten up the seconds of waiting. 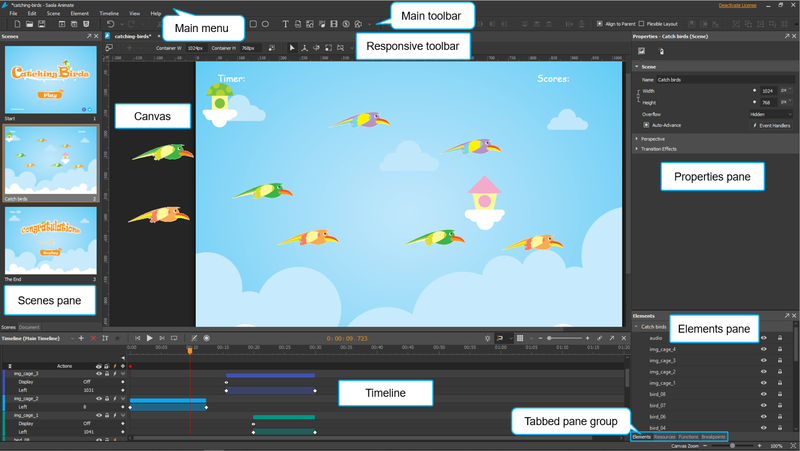 All things considered, Saola Animate is simple to use, and it deserves to the perfect HTML5 animation software. 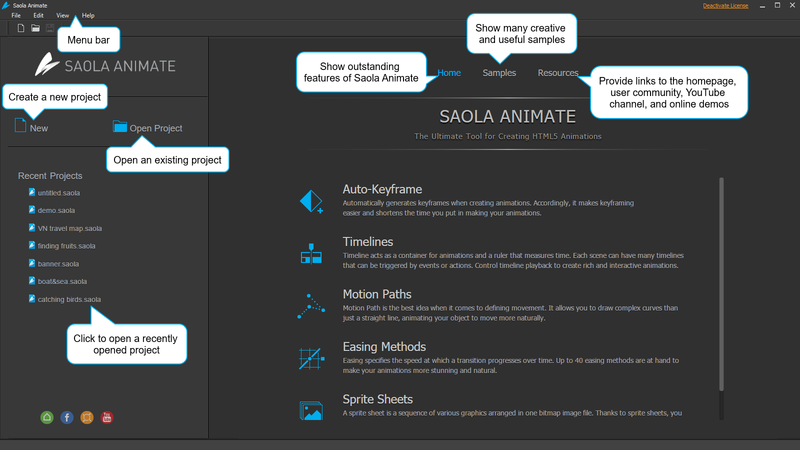 Give Saola Animate a go and see the benefits it can bring to your work.